XPilot iPhone is a port of the XPilot client for the Apple iPhone and iPod Touch. Do you remember Play Doh? Spirograph, Etch a Sketch, and Rubik's Cube? Hot Wheels and slot cars? How about model airplanes, boomerangs, and semi-legalfirecrackers? Of course you do; classics cannot be forgotten, and try as one might, once perfected they cannot be duplicated or improved upon. Some are still with us in various forms, some sit waiting to be rediscovered. XPilot is a game from the Internet's adolescence, obsessed over by a few networked gaming pioneers across the globe before being steamrolled by Doom, Starcraft, and the Web. It was technically groundbreaking and paved the way for today's massively multiplayer online games, but its true genius was its gameplay, a mixture of skill, strategy, and joyful mayhem. 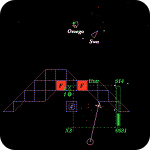 It owes its genesis to such uber-classics as Asteroids, but don't be fooled: XPilot featured a devious array of clever weapons and gadgets, physics-based 2D spaceflight, and introduced the internet to Capture-The-Flag, Deathmatch, in-game chat, and user-created game maps. With the touch screen input and always-on data connection, the iPhone is a perfect platform for a multiplayer networked game of XPilot. The original XPilot client relied heavily on the keyboard for all input (mouse control didn't come until later and a lot of old school folks would never even think of using it anyway). Inventing a new user interface control scheme for the iPhone was an interesting challenge. XPilot for the iPhone uses touch control to steer and control thrust. The main blaster is activated by a button in the corner of the screen. Additional weapons and items are used by opening overlayed menus (sort of like the iPhone keyboard) with buttons for each item, and the menus may be closed to not distract from normal gameplay. Because of the client/server architecture, a data connection is required for play. Due to the open-source nature of the original code, this project is open-source as well. All of the source code is available for free. It is licensed under the GNU General Public License. The source includes the XCode project file. Make sure you have the iPhone 3.0 SDK from Apple, start XCode, and open the XPilot-iPhone.xcodeproj project. Read the src/client/iPhone/README.iGLU text file to find out how to add iGLU. Compile and run! Click to embiggen. All images are real, live, in-game screenshots. The team that makes up 7b5 Labs has a very long history with the game of XPilot. They began playing in 1994, realizing that it probably takes a good year to become proficient. College classes notwithstanding, it was the game of choice and they could be seen on servers around the world with the nicks Han Solo and Blueshift. They created three massive maps that were only suited to moderate to expert XPilot players. The maps were 300x300 (huge by any map standards) and very complex, with tunnels, traps, wide-open killing fields, and an unhealthy amount of rotating gravity points. These maps were called Lair of Chaos, with the first one being created in September of 1994. This is a very new map, opened to the public September 15. It is tremendously more insidious and complex than most maps out there, and as such allows for a great deal more strategy, contains a variety of navigational challenges (Note; the previous phrase may be considered a gross understatement by some) and the ability for a large number of people to play simultaneously without the game losing its focus. The complexity is an attempt to make sure the game holds a challenging atmosphere with no shortage of new situations, instead of just more randomly placed blobs in a generic board. 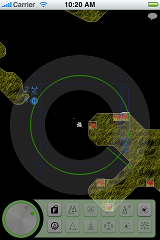 Also, the layout contains some (relatively) wide open spaces for free combat as well as many different interwoven tunnels and gravitational novelties; either should be readily accessable from most of the team bases, depending on your preferred style of play. © 2010 7b5 Labs. For more information contact info at 7b5labs.com.